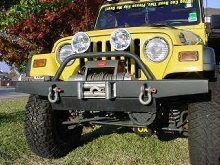 Designed for especially for Warn winches, our winch bumper is raised for over 4" additional clearance at the corners over the stock bumper and other aftermarket bumpers. Shackle mounts and lightbar/guard are integrated into the bumper. The lightbar/guard features tabs for mounting two off-road lights. All parts are powder-coated black.